To celebrate the opening of our Harrow salon, we’re taking a walk down memory lane to discover the town’s rich cultural history. Specifically, we’re talking about the Railway Hotel; a (now iconic) music venue that brought American R&B to the suburbs. By 1964, it was a fully-functioning club hosting live performances from bands like The Who – in fact, they played their first ever show here. Sadly, the pub had become a derelict site by the 1990s, and was burned down in 2002. Though it’s no longer there, the Railway Hotel remains as one of London’s most iconic 60s music venues; a place that helped to define mod culture and, in a broader sense, shape London’s ‘youthquake’ movement. The 60s mod look is one that has kept inspiring the fashion and beauty industries ever since the decade ended; from pixie cuts to bouffants, 60s hairstyles have become iconic for all the right reasons (unlike 80s ‘dos). The main thing to note about 60s youth culture – from fashion to music and film – is that it consciously separated itself from the previous decade. Whilst the 50s were associated with conservatism and domestic ideals, there grew a rebellious, counter cultural streak in the 60s which transformed the way young people presented themselves. Gone were the tight set curls that defined 50s femininity, and in came a freer look. At one end of the spectrum there were sharp, short cuts; on the other, you got loose waves with lots of volume. Pay homage to the decade that brought us Twiggy, The Rolling Stones and mini skirts, with these mod-inspired cuts from our creative team. 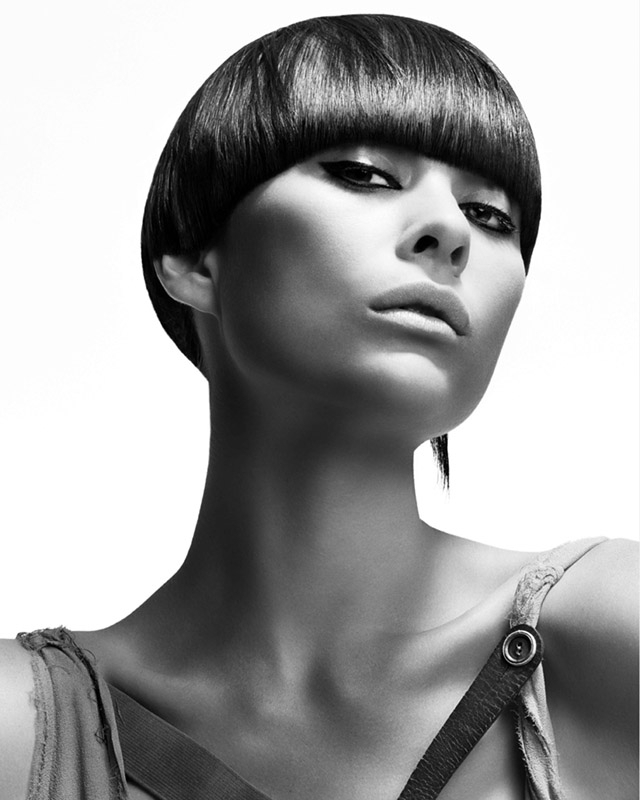 Mod fashion tended towards the angular, cropped cuts made famous by legendary hair stylist Vidal Sassoon. His ‘wash-and-wear’ ‘dos, which could be styled with just a shake of the head, liberated women from the timely regimen that came with setting their hair. Since ‘women were going back to work,’ Sassoon later said, ‘they didn’t have time to sit under the dryer anymore.’ Inspired by the clean lines of Bauhaus architecture, his looks were sharp and geometric. Taking the bowl cut from homespun to high fashion, his signature bobs and fringed ‘five-point cuts’ have become the stuff that modern hair mastery is built on. 60s model Peggy Moffitt turned Sassoon’s sleek helmet cut into her trademark – in fact, she still wears her hair the same way today. We’ve adapted Sassoon’s eye-skimming cut by adding curvature around the neck and leaving a little more length at the back for a slightly softer finish. 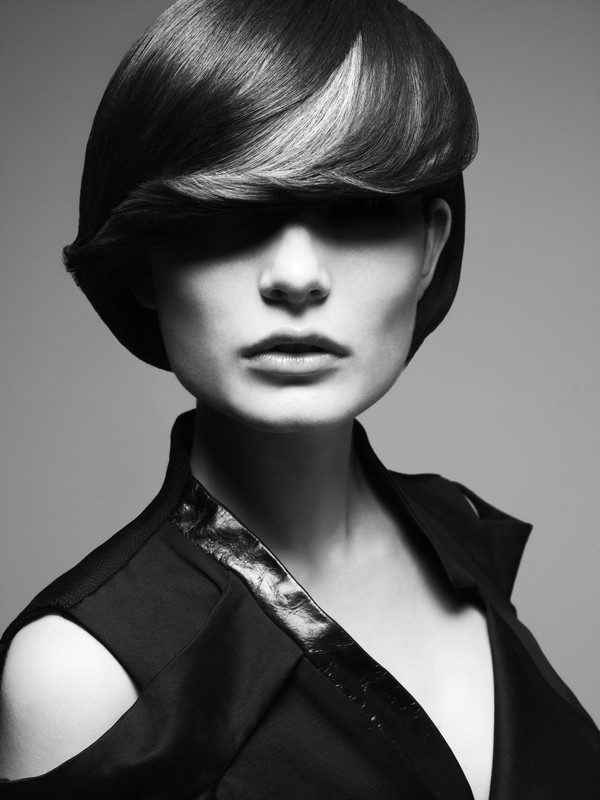 In the wake of Sassoon’s angular cuts, young women everywhere were chopping off their hair. In 1966, ‘the world’s first supermodel’ Twiggy joined these ranks and became an icon almost overnight. With her gamine features, she was the antithesis of everything that femininity had been presented as before. Capturing the essence of ‘Swinging London,’ her androgynous, youthful image was one that came to define the decade. Her doe-eyed makeup, petite frame and deep-parted pixie crop gave Twiggy a doll-like charm; her hair was always sleek rather than tousled, and she often tucked her side-sweeping fringe behind her ear. This hairstyle is ideal for anyone growing out a super-short pixie cut; ask your stylist to keep some length at the front once it’s grown out a little to recreate this look. When it came to hair in the 60s, it was a case of ‘the bigger the better.’ From the bouffant (see below) to the beehive, volume mattered. Blowout styles that were beautifully smooth with stay-all-day bounce dominated the fashion world, giving new meaning to the term, ‘bombshell.’ Volume usually began at the crown of the head; half-up, half-down ‘dos à la Brigitte Bardot exemplified the 60s siren look. Bangs were also big; model Jean Shrimpton’s choppy fringe and tousled tresses still look super-stylish today. We’ve added a blunt, full-fat fringe to offset the height of this voluminous look; with a clean line framing the face, it’s thoroughly mod[ern] too. Defined as a hairdo that ‘is styled so as to stand out from the head in a rounded shape,’ the bouffant bob was popularised by America’s First Lady Jackie Kennedy, as well as French chanteuse Sylvie Vartan. Unlike the beehive – an updo whereby the volume sits atop the head – the bouffant bob is weightier throughout (though it remains most voluminous at the crown). A heavy, side-sweeping fringe completes the look. We’ve modernised the hairstyle by applying colour more tonally to add depth. Using a volumizing spray at the roots, we’ve also lessened the need to use half a can of hairspray; a quick mist over at the end adds enough hold. This creates a shinier, healthier-looking finish and adds more movement. Learn more about Rush Harrow here!